Kenninghall Mill Lane towermill stood at Church Farm in Mill Lane just to the south of the adjacent postmill. The cap of the 5 storey tower mill was turned to wind with an 8 bladed fan. Frederick Pilgrim's towermill in Mill Lane stood opposite the Red Lion in Church Street. Title of Robert Peverett of Kenninghall, miller to a freehold parcel of land (1r.) 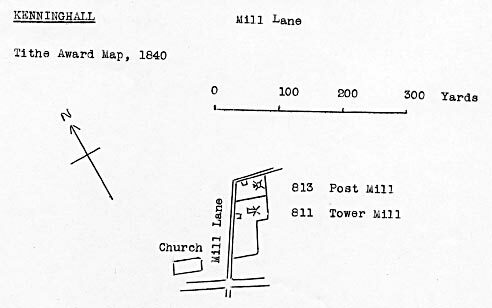 with windmill, house and outbuildings, all bounded to the west by Mill Lane in Kenninghall. An abstract of title to the property recites that it was once part of the second allotment (1a 1r 13p) by the Kenninghall enclosure commissioners in 1799 to the executors of the will of John Hawes. 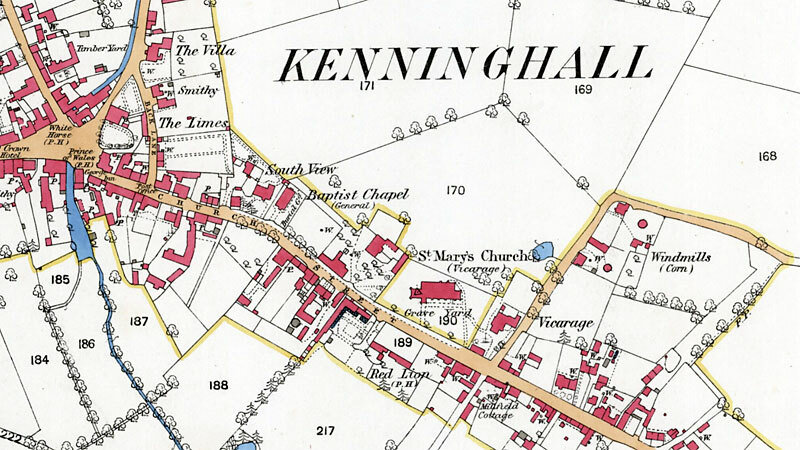 The messuage and land (then copyhold of the Manor of Kenninghall) was sold in 1801 to its then existing tenant, Stephen Harvey. In 1821, Stephen Harvey of Kenninghall, farmer, died, leaving his copyhold and freehold real estate to his nephew, Charles Turner. Under the terms of Harvey's will, his housekeeper, Eunice Farrow, was entitled to an annuity of £20 from the income from 1r of land. Turner and Eunice later married, and in 1835, conveyed the land to Frederick Pilgrim, miller. Pilgrim was responsible for erecting a tower windmill on the premises, but needing capital, mortgaged the property to secure a loan of £163. In 1836, the mortgage was repaid, and the property sold to James Foster Palmer of Snetterton. He immediately leased it back to Pilgrim for £20 annual rent. In 1850, Palmer sold the property to Robert Peverett of North Lopham, miller, but because Peverett couldn't afford to pay the full purchase price, Palmer agreed to become mortgagee to secure the eventual payment of the outstanding monies. By then, the property was described as being separated from the remainder of the allotment to Hawes' executors by a four feet high brick wall, apparently erected by Frederick Pilgrim some years before that date. In 1865, the property was enfranchised from its copyhold status by the payment of £45 and granted to Palmer, who was still the owner recorded on the manor court rolls. In 1870, and in acknowledgement that Peverett had long before paid the full purchase price for the property and had paid the enfranchisement fee in 1865, Palmer conveyed full title to Peverett. In his will, Peverett devised all his estate to his wife Lucy, and after her death, to his grandson, Robert Peverett. Peverett senior died in 1875, and in 1889, Lucy also died. The grandson, Robert, inherited and carried on the milling business, but soon had occasion to mortgage the business and premises. In 1901, the mortgage was transferred to Edward Charles Walker of London. 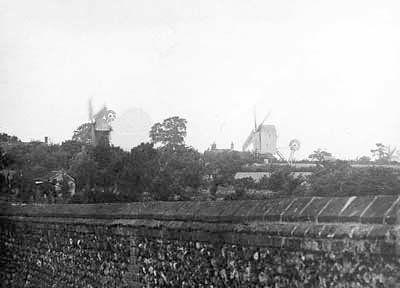 Peverett continued to occupy the property and operate the windmill. Documents include extracts for the wills of John Hawes of Kenninghall, gentleman, proved 1801, and of Stephen Harvey of Kenninghall, farmer, proved 1821. The Judge said on the material before him he should give judgement for the plaintiff for 30s. Henry A. Stanford's tower mill. Owner Mrs. Bauly. Sails removed by Mr. Collings of Kenninghall. Pulled down by Cook of Attleborough about 1911 after being idle several years. On 11th November 1970, Mrs Kemp of the Mill House of the northern mill wrote to Harry Apling to say the incoming new owners, Fernee, are renaming Church Farm Mill House FERNWOOD. Frederick Pilgrim repaid loan & sold mill to James Foster Palmer of Snetterton, who immediately leased it back to Frederick Pilgrim for £20 annual rent.